Thank you for opting to donate to the ArtsXchange Project for this event! After two years consolidating its vision, rallying community support and raising funds, the Warehouse Arts District Association (WADA) has broken ground on the ArtsXchange, a 50,000 square foot facility that will create sustainable, affordable art studios and educational space in the greater St. Petersburg Midtown community! 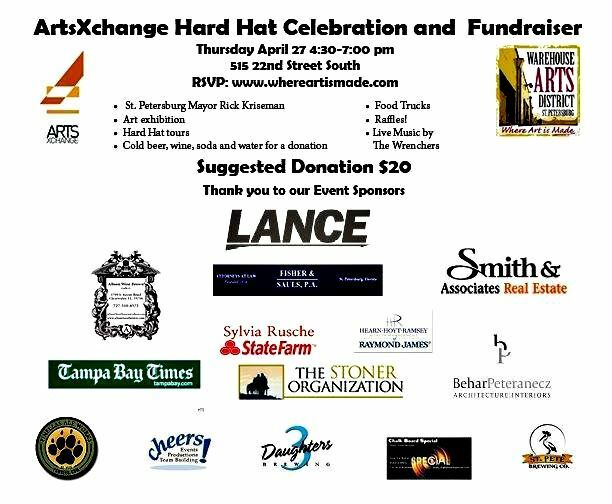 The ArtsXchange will be an amazing resource for the city of St. Petersburg, for local artists, and for the community at large. Construction is under way and we want the community to witness this vision as it comes to life. Remarks by St. Petersburg Mayor, Rick Kriseman at 5:30pm. Hard hat tours of the construction site. Opportunity tickets for amazing items such as a VIP tour at Kozuba & Sons Distillery, gift certificates to local business, free yoga, artwork, children's book and more! WADA has raised the funds to begin construction but still needs funds to complete the first phase of the project. Silver Sponsor: Fisher & Sauls P.A. Please join us in our endeavor! Can't join us? Please support WADA and donate anyway! Also feel free to print the flyer below and share it. Just click the image to download a PDF.